From an engineering standpoint, permeable pavement systems are essentially a filtered infiltration channel that’s covered with pavement. These systems promote ecological health and help reduce storm water runoff by as much as 100-percent, according to Cambridge. Aqua-Bric Type 1 is designed for the speedy removal of storm water. The Aqua-Bric looks and feels the same as Cambridge’s other concrete pavingstones, but also provides the environmental benefits of a permeable system. “Hardscaping”, or outdoor land development that utilizes stone pavers, retaining walls and other similar products to protect and enhance the natural balance of nature is becoming more and more popular as individuals and businesses seek to reduce their carbon footprint. 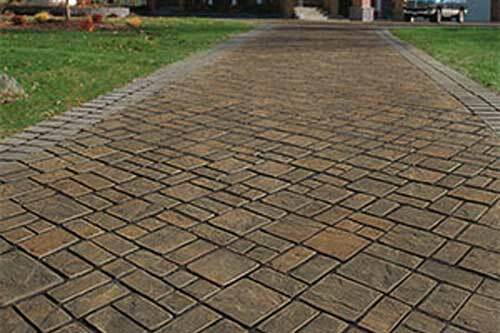 Cambridge Pavingstones Permeable Pavement System is made for efficient storm water management, making it an economically smart choice for driveways, parking lots and roads. Aqua-Bric Type 1 with ArmorTec from The Crusader Collection and tumbled-distressed from The Renaissance Collection is designed for the rapid removal of storm water. This paver possesses the same look and feel as our other concrete pavingstones, in addition to the added benefits of a permeable system. With dimensions of 5″ x 10″ with a 3 1/8″ thickness, there are slightly elongated openings along the sides. The rectangular form provides for minimal openings in the pavement surface, which allows for natural storm water drainage and groundwater re-charge, all while making walking more comfortable. From an engineering standpoint, a permeable interlocking pavingstone system such as this Cambridge collection is a filtered infiltration trough that’s covered with pavement. However, the joint filling and base materials determine the amount of perviousness and infiltration. The Ledgestone Permeable 3-piece Design Kit With ArmorTec from The Crusader Collection comes in sahara/chestnut and other color combinations with a “fade-proof” guarantee in sizes: 9″ x 9”. According to Cambridge, this permeable paving system reduces storm water runoff as much as 100-percent, and it is strong enough for both pedestrian and heavy vehicular traffic. In addition, the product has major curb appeal, and provides convenient access to underground utilities. More professionals are choosing permeable interlocking concrete pavements than ever before due to the environmental benefits of this type of product, and its ability to meet low (environmental) impact development goals. There are several design patterns for Aqua-Bric Type 1, such as the ‘running bond’- a regular, brick-type layout, ‘basketweave’, and ‘herringbone’. Contact Island Block & Masonry Supply for more information on Cambridge Permeable Pavement Systems. Cambridge Turfstone and Pavingstones can also be used as permeable pavement solutions in many project applications.